"Hot apple cider with caramel is served in a mug rimmed with spiced sugar for a warming drink on a chilly day." To make the drink rimmer, mix sugar, Diamond Crystal(R) Fine Sea Salt, and spice blend on a small saucer. Pour caramel sauce on another small saucer. Dip the rim of a mug or heatproof glass into the caramel sauce, evenly coating the rim. Then, dip into the rimmer mixture. Heat the apple cider and caramel candy in a small saucepan over medium-low heat. Stir frequently until candies have melted. 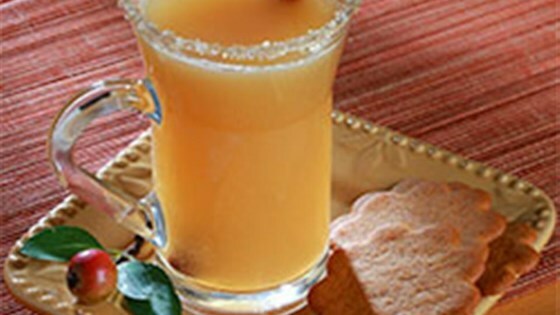 Ladle hot caramel apple cider into the spice-rimmed mug. This was heavenly! What a nice, cozy drink to sip on a cold winter day. I didn't have any apple pie spice (no cardamom in the house), so I used pumpkin pie spice in it's place. It was fantastic!